Welcome to the New and Improved Wylie House Blog! As you have surely noted, in 2015 Wylie House moved its web presence to a new home within the IU Libraries. The museum’s blog is now following suit in 2016! It will serve as the perfect place to bring you our monthly news, highlight recent and upcoming activities, and dig a little deeper into our history and collections. Wylie House is off to a busy start this spring semester. We are looking ahead and planning spring concerts, lectures, and exhibits. Keep an eye on our Events page for details! Wylie House is pleased to welcome a new student intern, Mary Figueroa, from the Anthropology Department. Mary has an interest in museum studies and will be curating our annual spring quilt exhibit as part of the Indiana Heritage Quilt Show, March 3-5 (http://www.ihqs.org/). We also welcome volunteer students, Hannah Kappes and Taylor Bacchus, both studying in the Parks, Recreation, and Tourism Department. Hannah and Taylor will be assisting with marketing and event management. We have several upcoming events this spring and their help will be invaluable! The museum’s involvement in I.U. classes continues to grow. Classes from the Education Department, English Department, Parks, Recreation & Tourism, as well as Apparel Merchandising & Interior Design will be visiting the museum this semester for tours, class assignments, and research projects. 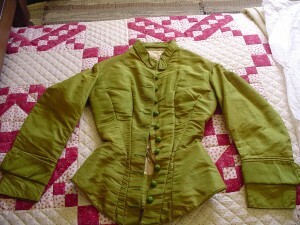 The museum is particularly excited to be working closely all semester with Professor Ashley Hasty’s History of Fashion course in order to integrate skills in information and primary source literacy. 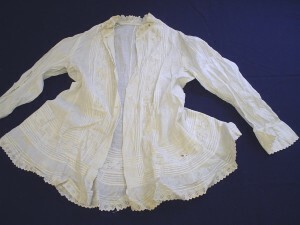 We will be assisting Prof. Hasty’s students with research and writing skills, and they will be using several of our historic documents and textiles for engaging study opportunities. Brightly lit candles, live music, Christmas carols and warm apple cider. These were a few of the many highlights of our annual Candlelight Open House on December 5th, 2015. The experience of Christmas has changed exponentially since Wylie families celebrated the holiday during the 19th century. Long gone are the days when the Wylie family would gather to open their stockings and celebrate the holiday. We here at the Wylie House Museum try to replicate the spirit of a 19th century Christmas as best we can for the Indiana University and local Bloomington communities every December by hosting a welcoming and celebratory event. Minus the candle-lit pine tree, of course. 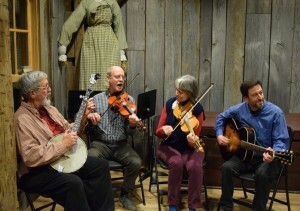 Visitors of the 2015 Candlelight Open House enjoyed a variety of different holiday experiences. Live music was provided by students from the St. Charles School Band and Bloomington’s Horseshoe Stringband in the Morton C. Bradley Jr. Education Center. Visitors of the education center were privy to holiday treats, egg nog, and warm apple cider. 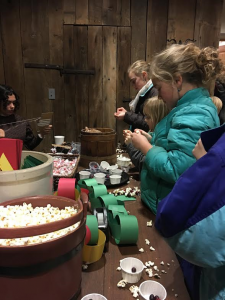 Located directly next to the snacks, kid-friendly crafting activities were available in the form of stringing popcorn and cranberries, as well as paper-chain making. Lining the walkways leading up to the Wylie House, luminaries were placed outside to welcome guests on the chilly evening. 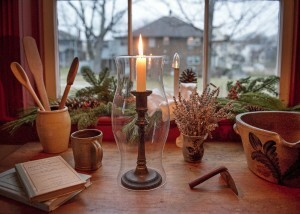 In order to bring the true feeling of a 19th century Christmas to life, docents dressed in period attire, greeted guests, and gave tours of the first floor by candlelight. Beautiful music filled the hallways of the home. Jacobs School of Music students, Kyle Schardt and Zechariah Landers, played classical guitar in the family room while Christmas carols were brilliantly sung by visitors and volunteers alike in the parlor. They were accompanied by the talented and generous pianist, Mark Wiedenmayer. Posted on February 1, 2016 February 10, 2016 by Author Bridget Albert Posted in | 2 Comments on Welcome to the New and Improved Wylie House Blog!